Closing Keynote: Getting giants to dance – what can we learn from designing large and complex public infrastructure? Airports are vital pieces of national infrastructure. They cost billions, and can take decades to design and deliver. We expect them to meet the day to day needs of millions of users, operate totally reliably, survive changing climate conditions, whilst providing a return on investment for their owners and operators. Stephen Pollard from Arup will explore the past present and future of a major airport in London, looking at challenges and successes to understand how best to manage design at the nexus of people, process, technology, and large complex assets. Stephen is the global infrastructure improvement lead for Arup, which is an employee owned 15K person capabilities consultancy in 80 countries. They focus on the built environment, and Stephen focuses on global ecosystems. Who better to close our our Summit? London Heathrow is a spectacular piece of infrastructure. He is lucky to be working now with designers, economist, planners, and operational specialists. 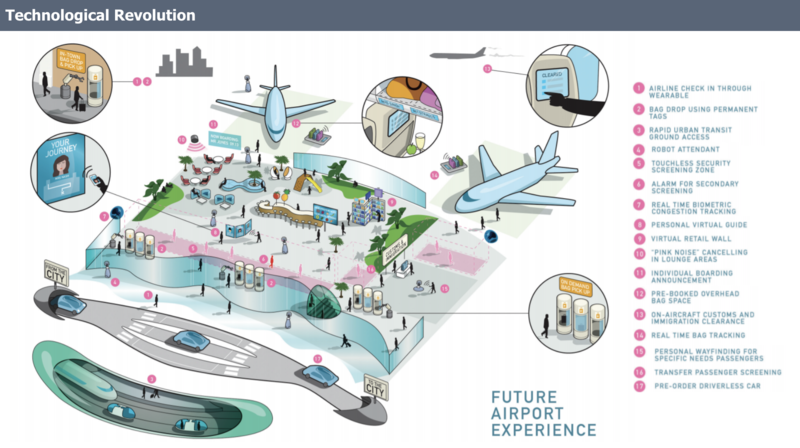 How do we make airports better? In his talk he will explore the parallels and differences with design operations. His presentation is in two parts. First, he will share with us some of the design challenges around airports. And second, then he is going to tell us a story of design evolution, as Heathrow was challenged to make the most value out of design. We can learn from how they organized to achieve that. Airports are large, complex beasts. To build one you need 40 billion dollars, 30 miles of baggage transport capabilities, and so much more. 78K people come to an airport to work each day. So it raises interesting large-scale design challenges. There is infrastructure to consider – water, air, public health, the facade, glass, IT … and each of those disciplines come with their own integral design language. But these need to be made to dance around major topics like security, operational efficiency, and of course passenger experience. There are good design patterns, but the security is a malevolent threat to a good experience. Every time we see a problem, we need to bring in new skills and capabilities to address it. What if you could pre-book your baggage into the overhead bins on the plane? That is already happening in Australia. What about a touchless security zone? That is further into the future. We face challenges in layering our design, our thinking needs to stretch and flex towards the future. If you have seen the What Why How TED Talk by Simon Sinek, you’ll recognize this framework. People don’t buy what, they buy the why. To explore the shift from what to why, he will look at a specific example. These are some of the challenges, outcomes that stakeholders are looking for. And some of these don’t align. For example, you can’t increase slot allocations (take-offs) and improve air quality at the same time. So with these types of challenges it becomes clear that if we want to do good design, we have to do more than deliver the design in front of us; we actually have to influence the strategy. There are also some very interesting constraints. It is a regulated business model. For example, the landing charge is what airlines are looking at – it needs to stay flat. It has to equal the amount of money you spend running the airport, minus depreciation. It doesn’t incentivize the airport to improve operational efficiency of your customer (the airline). If we need to move people between one terminal and another, should we bus them? It’s cheaper for CapEx, and OpEx. But it is not good for the airlines. However, if the focus is on passenger experience, you might invest in a people mover. So designers needs to be center stage in these discussions, and you need deep domain experts who can truly engage in these problems. How does this lead to the role of design in operations? There is a five year cycle in spending. In the Define stage we establish the key factors. Is it worthwhile to improve resilience? Investment conditions / design scenarios are considered without considering the solution space. If the brief has been set well, in the Develop stage, we focus on a key element – collaboration. Integrating skill sets are absolutely key. Bringing many parties together is key. Finally, in Delivery, we have the process of specifying, testing, proving. Designers know this is the feedback loop – what data will enable us to improve our designs. He would not have called this Design Operations before now. That challenge of setting right culture, tools, and process gets to the heart of what we need to achieve. For a project like this, you may be dealing wth 80 tier one suppliers who have 20K suppliers beneath them, and 20 or 30 different design organizations. So developing a shared language and culture is really critical to deliver a program like this. How has this evolved in the past 20 years at Heathrow? He is going to share a series of case studies with us, going back to early 2000s (a 15 year period). In business terms, it’s an investment journey of 40B pounds. Terminal 5. The focus of this project was on designing and building something that could be delivered on time. And to avoid litigation. British Airways wants to deliver a new kind of passenger experience, and Heathrow wanted to deliver an innovative product and brand. Firms were selected and brought in. They were given a clear view about how to work as one team. But the only benchmark they achieved was a failure to launch. Within a half an hour the new terminal had created such a backlog, it took them 6-7 months to fix it. There were many lessons learned. The approach to working together was really quite innovative, and has been carried forward they really did achieve something quite special at that period. Program Management was also key at that time. But it was mainly focused on construction delivery, so they were innovative, but they hadn’t gotten their own people ready. Terminal 2. The ambition was to deliver a working operation, and the same quality of brand experience. 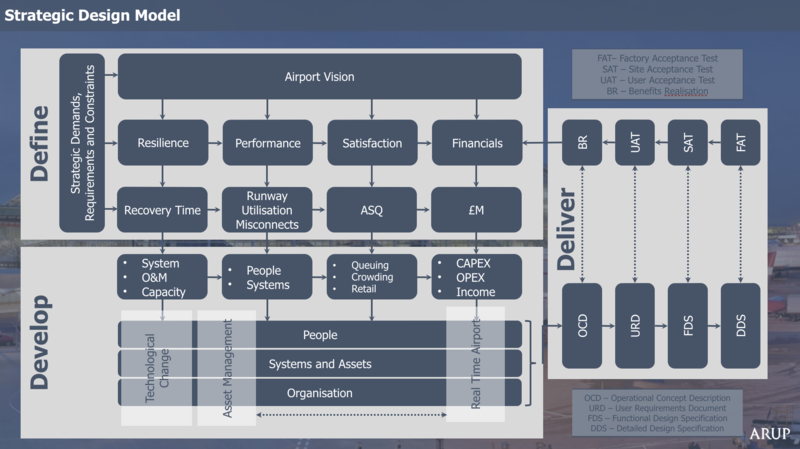 But to be able to do it for 22 airlines sharing the same building, there was a really significant upshift in complexity. They had a real focus on getting back to basics. Partners were not particularly well integrated, but the did learn a lot from what happened in Terminal 5. That made them an intelligent client, and they were selective in how they added resources. The Q6 Program. In that financial climate, it was tough. 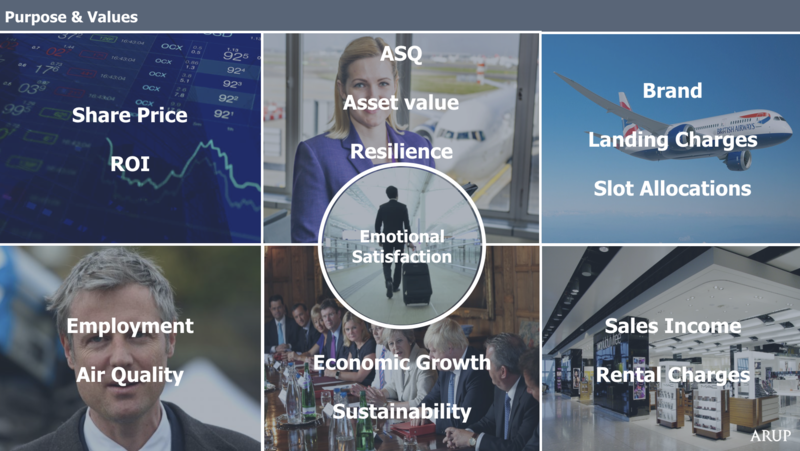 But they needed to improve performance across the airport – key themes were baggage handling, passenger experience, image of the airport, and asset management. These were high level aims, instead of activities. To do that they introduced new roles – program designers. The goal was not to ‘run this building program’, but rather use the capabilities we had at our disposal to improve passenger experience. Projects were evaluated against the value they were supposed to create. And there was a focus on cultural values, and showing they could deliver a world class project. This project had quite a bit of success. 3rd Runway. And now we are planning a total redesign of the airport, including redirecting a major river. The focus is something hard to pin down – a political, vision, an economic vision, and an investment strategy. How do you break up 40B of investment into 5B increments to move the operation forward while keeping the landing charges flat? They have kept the program designers, but they are now called ‘design integrators’. They are managing the complexity of moving 380 companies through changes to their business models. They are working hard to bring those teams together, so business and design can understand each other. Heathrow has been at the forefront of the techniques of deliberately setting and driving their culture. They put everyone on the team through a rigorous training process, to ensure people know how to work together. How to you communicate your discipline, your approach to your own work is key. And how do you plan for the technology 25 years in the future? There is good instrumentation on all the assets now – buildings, busses, planes. They can really make thoughtful decisions based on a substantial amount of quantitative data. 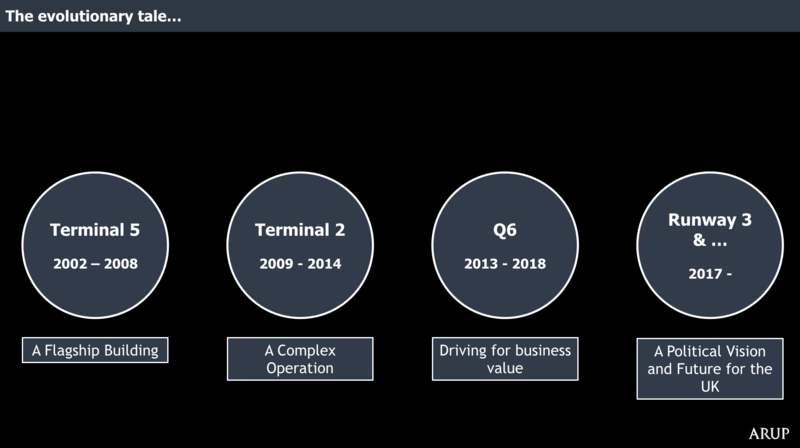 He will briefly review these four periods in Heathrow history, and then do a final recap. There has been a steady evolution in how they are thinking about these programs over the years. We have to move from getting the design right to delivering on a shared strategy. It has required new ways of working, new tools. And, more recently there has been a deliberate focus on values throughout. So, he believes Design Operations is at the heart of success and how we achieve outstanding quality and value in design, and literally building a better world. A question around iteration. How far into the future do you plan, and when in the lifecycle of these designs do you start? 50 years for buildings, and the investment strategy could be 3-10-15 years. Technology lifecycles are much shorter – 20 minutes. They used to wait until the last responsible moment to do the technology part, but their thinking has evolved, now they look at the large scale of the business timeline. And at the microlevel we have to decouple and layer in the ability to iterate at the right speed. The switch from delivering a building to deliver a passenger experience. You talked about new positions. What were the larger organizational / cultural changes to make the push in that direction? The old structure was capital projects (basically, engineering). The real cultural shift was realizing that there was more to it than raising a building. They focused on the business outcome of passenger experience. That requires a change in the supply chain, with a focus of those outcomes. And that requires service architecture, emotional mapping to set the framework for what the team needs to be working on. In the capital projects side, they achieved some things quickly. What was harder was linking internally between operations, strategy, and planning. But they had very good leadership at the senior levels, leaders who recognized that things needed to change. 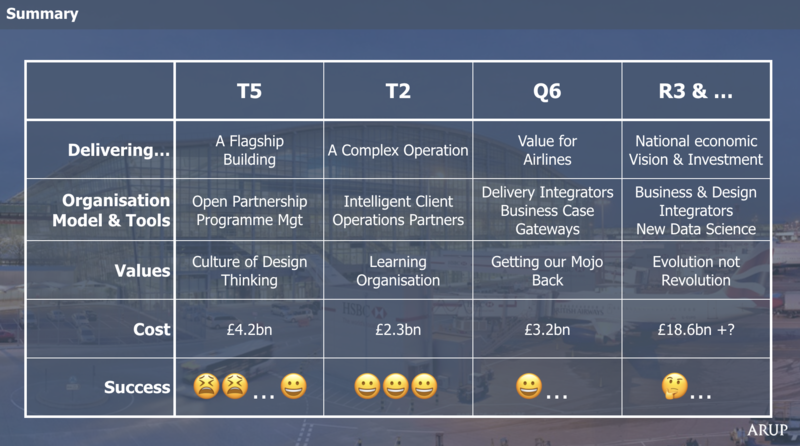 That was one of the good things that came out of the Terminal 5 project – they redesigned their leadership structure, they created a much more tight-knit team. When we create extraordinarily complex systems, they fail spectacularly. What can we do about that? We are drilling into what is resilience about? Not a traditional engineering approach to that problem, though. One key challenge is the baggage handling system itself. We did some original thinking on it. The automation involved is quite complex, but it wasn’t properly designed for people – in fact, in many cases with their interactions, they were making things worse. How do you design the job properly, train them, inspire them to change how they were working? You can’t do something like create a whole backup / parallel baggage handling system. You have to take a broader look at all factors that affect resilience. Climate change causes us to think about all kinds of things they need to be resilient to. If the river is going to flood, multiple agencies ( like roads and rails) need to be prepared to address that. In some cases, they need to engage and reach into organizations who may not realize they need to be part of the conversation.